Saint Petersburg is one of the most beautiful cities in the world, and is the cultural center of Russia. It’s nothing like all the other cities in Russia. We promise you, it will surprise you in all the ways imaginable. You definitely won’t be disappointed. Saint Petersburg is a port city located on the Baltic Sea. It was built in the early 1700’s according to the dream of Peter the Great. As soon as you enter this city, you will be absolutely mesmerized by it’s majestic architecture, and you will notice the touch of Peter the Great. Peter the Great was a Russian tsar in the late 17th century. He was mostly famous for his reforms to make Russia a great nation. He wanted to transform Russia into a progressive nation by bringing in ideas from western European countries. His legendary trip to Europe was very influential in his architectural choices when building Saint Petersburg. No wonder why Saint Petersburg reminds many visitors of many European cities such as Viena, Budapest, Amsterdam and even Paris. Moreover, Saint Petersburg was build by Swedish prisoners from the Great Northern War. It was the actual capital for over 200 years (1712-1728, 1732-1918). Let’s take a trip through the lovely architectural sights of Saint Petersburg. First, and most amazing building is the majestic beauty of the Hermitage Museum. As you can see on the picture – it’s quite breathtaking. Once you get inside, you’ll get to admire a big variety of its art collection from historical sculptures, monuments, paintings to collections of important historical artifacts and many more. Moreover, when you’ll be walking inside the Hermitage Museum, you’ll get the royalty feel. There’s no doubt about it. Russian Tsars had expensive tastes, and loved luxury and opulence depicted in gold colors and actual gold. 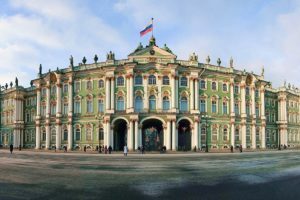 Just remember that the Hermitage Museum is quite big and you will require a day or two to get to see the majority of its art collection. Undoubtedly this museum is a real treasure for all the art lovers. 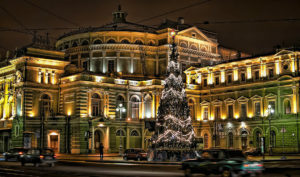 The second building that is worth seeing is Mariinsky Theatre. It’s a grand complex for music, opera and ballet. It’s definitely advisable to get a ticket, and watch one of their amazing performances. After all, it’s the famous Russian ballet, you won’t have the same experience anywhere else in the world. 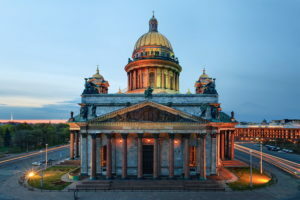 There are plenty of other architectural gems that are worth visiting, some cathedrals like Church of the Savior on Blood, St. Isaac’s Cathedral and Kazan Cathedral are among them. No trip to Russia is good without a touch of Orthodox religion. You don’t have to be a believer to enjoy the beauty of these cathedrals. St. Isaac’s Cathedral is the largest Russian Orthodox cathedral in the city. Furthermore, it is the largest orthodox basilica and the fourth largest cathedral in the world. Now it’s also a museum complex, however; the religious services were also resumed, after the fall of communism, in the left-hand side chapel. It’s worth getting a ticket and visiting this historical place. In addition, there’s a wonderful restaurant Mansarda nearby where you can eat or have a drink, and admire the views of majestic St.Isaac’s Cathedral. You will have to save a whole day for a trip to Peterhof Park. 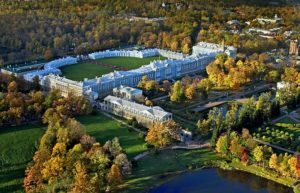 It’s a series of gardens and palaces often called as Russian Versailles. 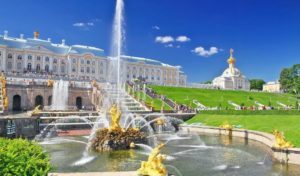 Again, everything there – sculptures, buildings, fountains and even a church -is created and designed in accordance with grand ideas of Peter the Great. Most of original structures of Peterhof were destroyed during the Second World War by German Troops. Later though most of it was restored and in 2003 there was its 300 year anniversary celebration. Saint Petersburg is known all over the world for its unique nature phenomenon- so called white nights. Since Saint Petersburg is the world’s most northern city, the nights (June 11-July 2) are light and bright. So take a walk around the city’s rivers and canals at night in almost broad daylight. Apparently it is also the best time to see the drawbridge opening which happens only during the night. Check the schedule here. Another full day excursion that we recommend you to plan is a trip to Tsarskoe selo which was a residence of Russian imperial family and all the nobility. Tsarskoe selo is an amazing place which is a part of municipal town Pushkin now. It is surrounded by gardens and beautiful architecture such as Catherine Palace and Alexander Palace. The biggest and the most beautiful attraction there is the Catherine Palace. It was built in Rococo style, and was used as a summer residence for the Russian tsars. The Great palace of Tsarskoe Selo (initial name) was built for Empress Elizabeth (daughter of Peter the Great and Catherine I) by Bartolomeo Francesco Rastrelli. Later, it was renamed into Catherine Palace, and the new mistress Catherine II along with the Scottish architect Charles Cameron brought their finishing touches. Catherine II, also known as Catherine the Great, was Empress of Russia, and reigned for 34 years (1762-1796). She was considered one of the most skillful and astute rulers of Russia. Catherine the Great, just as Peter the Great, strongly pursued the policy of Westernization, and for that was named an “enlightened despot”. To find out more about the fascinating history of Russian imperial family, you must definitely visit Pushkin, and enjoy Tsarskoe Selo. 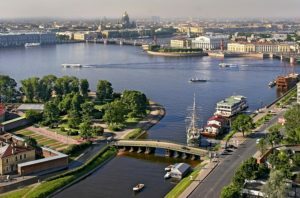 Here are some other things you can do in Saint Petersburg to make your stay more exciting and enjoyable. 1.Take a riverboat tour along the Neva river. Best time to do it would be around sunset. The views are absolutely worth it. If you are a couple you can take a romantic boat ride just for two. Head over to one of the iconic restaurants, such as “The Idiot” named after Dostoevsky’s famous novel; Koryushka – a restaurant with a wonderful view on Hermitage Museum and Neva River which offers Saint Petersburg’s traditional fish – koryushka; and the famous Yat that has a very unique atmosphere and traditional Russian cuisine. Kunstkamera is Peter the Great’s collection of natural oddities. This is a very unusual type of entertainment. You might be surprised at the kind of things you will see there. 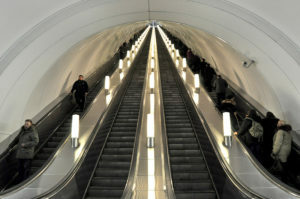 4.Catch a train ride inside Saint Petersburg’s metro. Every station is an experience on its own. You will see the beautiful art work and murals at almost all the stations. But here are the ones to look for: Admiralteyskaya (line 5), Ploshad Vosstanyia (line 1, 3), Kirovskiy zavod (line 1) and Avtovo (line 1). It is interesting to know that Admiralteyskaya is the deepest metro station in Russia, and the second biggest in the world. 5. Get inside the famous Russian Cruiser Aurora. Aurora served in the Russo-Japanese war, and survived the battle of Tsushima. 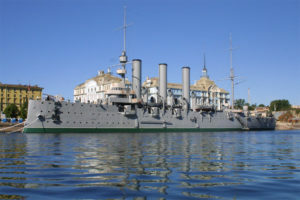 It is also linked to the October Revolution in Russia in 1917 that started with a blank shot from the cruiser Aurora to the harbour as a signal to start attack to the Winter Palace and take over the Government. 6. Have a stroll along city’s famous Nevsky Prospekt which is the main street in Saint Petersburg. The whole street is lined with all kinds of shopping centers, entertainment, picturesque and historic buildings, churches and even art. 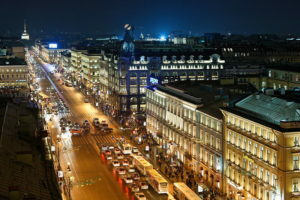 Your most expensive and top hotels are located along Nevsky Prospekt. Faberge Museum is another unique place to visit while in Saint Petersburg. The museum has the biggest collection of Fabergé eggs in the world. Carl Fabergé was a famous Russian jeweller known all over the world. In addition, nine Imperial Easter Eggs are also displayed in the museum. These famous eggs are not only jeweled works of art, but also – unique historical artifacts. 8. Take a ride on the high-speed train Sapsan. It’s comfortable, safe, beautiful and super fast. It can reach the speed of 250 kmph. 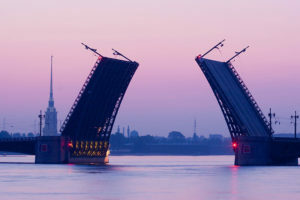 It means that it will take you only 4 hours to get from Saint Petersburg to Moscow and vice versa. Believe it or not, but some people actually travel like that twice a day if they happen to work in Moscow and live in Saint Petersburg. If you are on a short trip in Saint Petersburg, consider taking a train ride to Moscow to get a feel of Russia’s capital city. There are many other things to do, and sights to admire. Such as Peter and Paul fortress, the State Russian Museum, Leningrad Zoo, Summer Garden and others. For holiday ideas, booking excursions and accommodation in Saint Petersburg or any other place in Russia, contact our consultants for an expert advice. For matches that will be hosted by Saint Petersburg check out match schedule article.